Slender Man Is Heading To The Big Screen!!! Slender Man is one of those bits of lore I just never really got into. I can see the draw of it and I can see the wealth of material that is there to mine for a movie, so it makes sense that a movie is in the works about this fabled and completely fabricated creature. In 2009 an online forum titled ‘Something Awful‘ challenged their members to make everyday photographs appear paranormal. 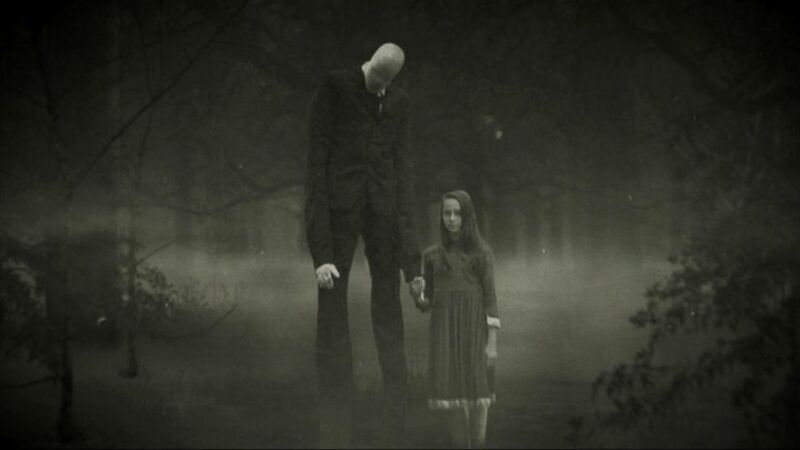 Eric Knudsen broke the stale and trite entries with two photos of children with an unnaturally tall, thin, featureless faced man standing behind them – and Slender Man was born. The stories and Slender Man sightings increased and have taken on a life of their own. The backstory tales gained steam and who knows what stories the movie will include, but I’m kind of curious to see the final film. Writer David Birke (‘13 Sins‘, ‘Gacy‘) will be penning the script and the flick should head into production in 2016. This entry was posted on Wednesday, May 4th, 2016 at 3:34 pm	and is filed under Film, News. You can follow any responses to this entry through the RSS 2.0 feed. You can skip to the end and leave a response. Pinging is currently not allowed. « Russell Crowe Has Signed Onto ‘The Mummy’ Reboot With Tom Cruise!! !